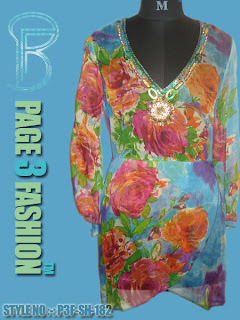 Multi color floral print dress with overlap style has V neckline and long sleeves. It has Indian touch hand embroidery on neckline. Dress has womanly spark to spread. •	Specially designed for any bash. •	Overlap style and embroidery. •	Finished from good quality Viscose Chiffon fabric.